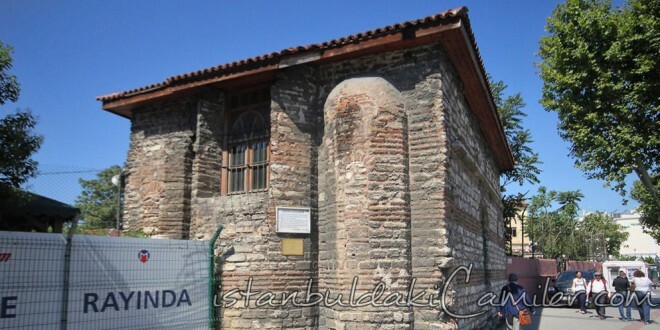 Mustafa Cavus Mosque is a Byzantium church which was turned into mosque by Mustafa Cavus who was one of the sergeants and servants of Fatih Sultan Mehmet Han after the conquest of Istanbul. The mosque, also known as ‘Monestry Chapel’ and ‘Church Chapel’ was built in 13th century. The walls of rectangular mosque were built of brick. The wooden roof is covered with roofing tile. The mihrab is made of plaster and pulpit of wooden. After it was turned into mosque, during a restoration a wooden minaret was added to the mosque which did not have one then, but the minaret did not last until today. The entrance gate is through IETT garage, and stili it is used as chapel by IETT personnal. The mousaleum of constructor Mustafa Cavus is not known.